This semester, students in the WVU School of Public Health are helping to implement a training program that will assist the area’s older adults in raising their grandchildren. In 2015, West Virginia ranked fourth in the nation in the number of children being raised by their grandparents. By 2017, the Mountain State was tied for second with Arkansas, while Mississippi was first. Over 20 percent of those families live in poverty. As part of their field placement experience, three undergraduate Public Health students are working with After School Explorers and Preston County Senior Citizens Inc. to bring the Healthy Grandfamilies training program to the Kingwood area. The program is an initiative led by West Virginia State University to provide free information, resources, discussion groups and follow-up services to grandparents raising one or more grandchildren. Miriam Rosenberg helps during the Healthy Grandfamilies training in February 2019. 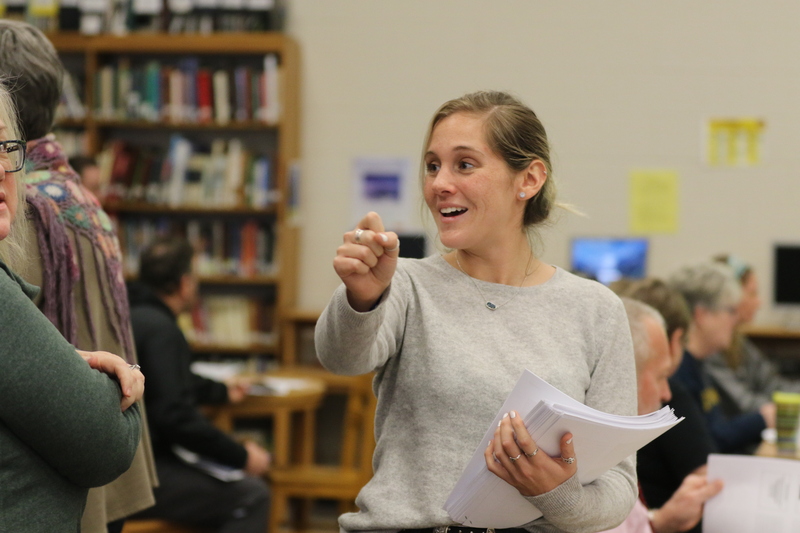 The students – Alison Stottlemyer, Michaela Stull and Miriam Rosenberg – helped to plan and execute the February 2019 training program at Preston High School, which included parenting in the age of technology, self-care for those raising their grandchildren, navigating the legal system, and recipes for healthy and affordable meals. According to Susie Huggins, program director of After School Explorers, WVU Center for Service and Learning played a major role in matching the Public Health students with her program. Stull, a senior in the Public Health major, said she has learned valuable lessons from the real-world learning experience. 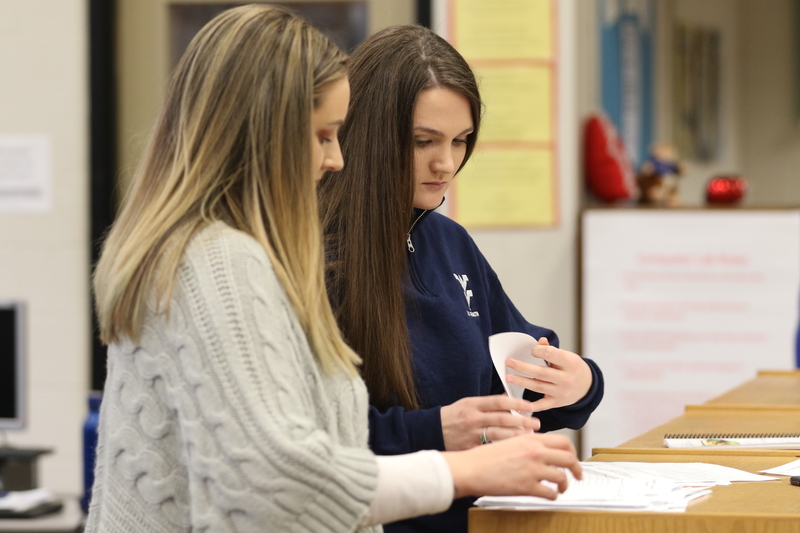 Alison Stottlemyer and Michaela Stull prepare documents during the training. Rosenberg, also a senior in the Public Health undergraduate program, said she’s glad her major gives her the chance to work on improving communities and their health, including families with grandparents as the providers. “I like that we focus on the broader issues at hand,” she said. Stull agrees. “The Public Health program has allowed me to put education into practice to contribute to the betterment of the world around me,” she said. In addition to the students’ efforts, the training is also supported by the Preston County Board of Education and the Caroline Haase Trust, a memorial fund established at the School of Public Health to support educational outreach and resources to agencies and entities providing services directly to seniors in Preston County. Haase, of Independence, WV, passed away December 24, 2008. She raised three children and was a school teacher in Crystal Lake, IL, and later at the Newburg School in Preston County, where she retired. Haase volunteered for several area service organizations, including an after-school program in Arthurdale and North Central West Virginia Community Action HeadStart. She was an active member of the Preston County Family Resource Network and Preston County Literacy Volunteers. Additionally, Haase volunteered with Preston Memorial Hospital. The memorial fund was established through the WVU Foundation, the non-profit organization that receives and administers private donations on behalf of the University.